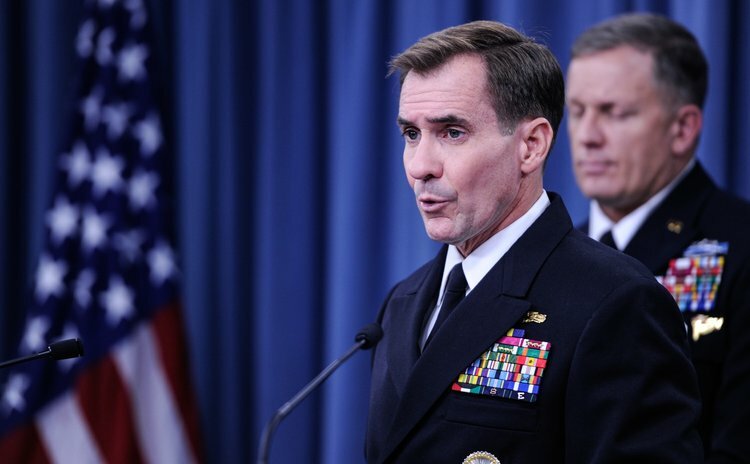 WASHINGTON D.C., Sept. 23, 2014 (Xinhua) -- Pentagon Press Secretary John Kirby speaks during a briefing at the Pentagon in Washington D.C., capital of the United States, Sept. 23, 2014. WASHINGTON, Sept. 24 (Xinhua/Sun) -- Using a mix of attack aircraft, bombers, fighters and remotely piloted aircraft, U.S. military forces continued to attack Islamic State (IS) forces in Iraq and Syria, the U.S. Central Command said in a statement. According to the statement, eight airstrikes were conducted targeting the IS in the two countries from Monday to Wednesday. Two airstrikes west of Baghdad destroyed two IS armed vehicles and a weapons cache and other two airstrikes in the southeast of Erbil, Iraq, destroyed several IS fighting positions, the statement said. An airstrike in the northwest of Baghdad on Tuesday destroyed an IS armed vehicle, it said. An airstrike in Syria damaged eight IS vehicles and in two airstrikes conducted Monday as part of the operation over Syria, two armed vehicles were destroyed, it said. The U.S. Central Command has conducted 198 airstrikes across Iraq against the IS, and along with partner nations, has conducted 20 airstrikes against the IS in Syria.